One illuminating study compared the life success of high-school graduates and dropouts. It found that, though the former group did tend to do better, their success wasn’t due to higher intelligence. Rather, they exhibited higher perseverance. This is what had enabled them to work through high school and also helped them deal with obstacles later in life. Another study found that students who had attended a prestigious preschool went on to do better than their peers in many areas of life. But the difference didn’t come down to high IQ: at the preschool, they had picked up skills like curiosity and self-control, and these skills contributed to their success even into their forties. So remember, it's not about being the smartest, it's about resilience and your will to succeed. My wife taught me something great! Actually, she has taught me a lot of great things but I thought I’d share a short one. If you speak to children like you think children should be spoken to with a funny cute voice, then they will stay childish for longer. If you speak to them as you would anyone else, they often rise to the occasion. When the American author Pamela Druckerman moved to France, she was surprised to find that the restaurants she went to rarely had a separate kid’s menu. Instead, children were expected to eat the same food as their parents. She saw something similar in French kindergartens, because the French want their children to experience a variety of cuisines and develop their palates. French children are exposed to a much greater variety of tastes and textures than some of their Australian and American counterparts and develop a healthier relationship with food. Kids don’t grow up overnight, but if we dumb things down to a level we think suits them, they adjust themselves to that level. If we speak to them with more maturity in an appropriate way, they are more likely to develop with more maturity. As we approach Shavuot – the festival that emphasises the importance of growth, maturation and a challenging of our Jewish literacy, we should learn from the French and stretch ourselves beyond our expected limits. As is often the case, Judaism is watered down to provide a sense of ease, let’s use this Shavuot to extend ourselves. As the Torah is re-revealed to each one of us this coming Saturday night, let’s embrace the challenge of maturity. It is within our hands to help shape the way in which we and the children we interact with view themselves – let’s teach them to rise up, own up and stand up with maturity! The last few weeks, culminating in Pesach, have forced me to consider parenting in a different light, especially how much time parents spend with their children and so I wanted to share a thought. In 2013 after a suspected security breach, US telecommunications company Verizon, conducted an internal audit. It was discovered that one of the organisation’s employees, a software developer in his mid-40s, had been outsourcing his job to a company in China. In paying them a meager fifth of his salary to do his job, he chilled out and spent his hours surfing the net and watching hours of frivolous content on YouTube. With the term once only heard in the hallways of large businesses, today the notion of outsourcing has managed to permeate almost every aspect of our lives. We have come to value outsourcing as a way of managing our hectic existence. It has become the key to unlocking productivity and efficiency in our lives and has provided employment and opportunity to others whose specialties complement ours. Is this not the ultimate win-win situation? In a world that places ease above exertion and results above effort, it is no wonder that outsourcing, a modern-day synonym for convenience, has managed to infiltrate even the most personal and sacred spaces of our daily lives, none more so than when it comes to our children. Whilst the outsourcing system has allowed us to get more jobs done, what we have failed to assess is if we are doing these jobs right. Time that was once spent by parents intimately involved in their children’s upbringing and education is now punctuated by a plethora of activities and personalities - sports coaches, school tutors, activity coordinators, friends, and digital distractions. Our children’s time has become a space for occupation, rather than stimulation, a job often done by someone else. Our children’s time should be viewed as a finite entity. The more time occupied by means of outsourcing, the less time attributed to the source of their moral development and formation of self - the influence of the seminal parent relationship. It is, therefore, incumbent upon us to ask ourselves, how much time are we spending with our children, communicating and interacting with them? Are we actualising our responsibility as parents to inform their moral development in a morally ambiguous world? In the case of parenting, outsourcing quite literally refers to our children moving out from the source - a departure from the critical influence of the parental relationship. Forgoing the opportunity, in the form of valuable time spent together, to imbue our children with the values, skills and principles we hold dear, inhibits their ability to do the same for their children and in turn diminishes the legacy we leave for future generations. Parenting, however, is not and should not be a ‘one man show,’ for as the literary similarity between the words horeh (parent), moreh (teacher) and Torah allude, there is in an inextricable bond between the terms. We make a choice in our children’s schools, teachers, youth movements and communities based upon the impact and influence they will have on their development. This decision is not an alleviation of parental responsibility but an expression of it, for as the words express, Torah and our truest source of education, shares its roots with both parents and teacher. This sacred syndicate is best modeled in our Jewish communal structure, in which our communities are built around our schools and sustained by communal funds so that none are excluded. Intrinsically we know, that parents can never absolve themselves of the responsibility to be involved in their children’s education, just as we seek more than a formal education, in the form of moral and social reinforcement from our children’s schools. Outsourcing parenthood is the catalyst for ambiguous moral messaging in our children’s lives. Conversely when parents’ purposefully collaborate with us in the schools and the community, our children become the beneficiaries of a partnership that promotes consistent and fortified moral education. Unlike the Verizon employee, who sought to outsource his livelihood and responsibilities, there is no show worth watching at the expense of our children’s educational and moral development. Whether as guiding parents, good teachers, or as supporters of communal educational institutions, we are the spiritual conduits of Jewish values, a job only we can do. Nothing ever happens in the past or future. Time is merely a succession of each moment. Whether you feel annoyed, happy or sad, you experience that emotion in the present. Similarly, when you anticipate or fear the future, you’re only capable of imagining that future in the now. It’s great to plan for the future, but the place to live and feel is in the now! Decisions can be tough, but January 1st is the single day that the most are made around the world. So what do you choose? The 80/20 principle can be a good way to go. In short, 80 percent of results often come from 20 percent of actions, so in many companies, around 80 percent of the sales can come from 20 percent of the products. In life it’s likely that around 20 percent of habits are responsible for 80 percent of happiness, like the short but quality time with your family, yourself or helping others. This 80/20 rule applies to unhappiness too, so it's great to think about when breaking bad habits. When it comes to making effective New Year’s Resolutions or any resolutions for that matter, try to focus on making small changes that will have a big impact and through this may you enjoy an incredible 2018 of happiness, health and success! Look at the love in their eyes. 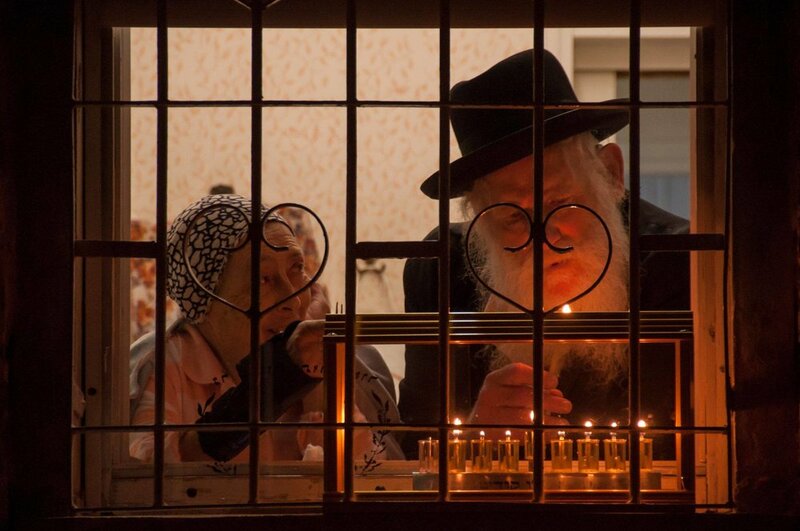 This is one of my favourite Chanukah photos by @Nitzan Assaf. When asked what the secret to their relationship was, she answered, ‘our appreciation for one another only increases each day.’ As we finish lighting the candles, may our warmth and appreciation for those we hold near and dear only grow - Chanukah Sameach! It was the second century BCE. The Greek-Assyrians tried to assimilate the minority Jews within the majority culture. With individuals they succeeded – but with the nation they failed. The mighty army of Antiochus waged war on the few Maccabees, but, ‘the strong were delivered into the hands of the weak, the many into the hands of the few.’ They rummaged through the Holy Temple to rekindle the spark of hope that the Menorah represented, and everything was destroyed, except one pure jar of oil with the seal of the High Priest. The oil should have only lasted one day but it lasted 8 days. Last night I retold the story to my children, as we sat by the first candle. And it never ceases to amaze me, ‘in those days, at this time.’ I am a realist and yet the odds never seem to stack up with our people. David Ben-Gurion was right when he said that ‘in Israel, in order to be a realist, you must believe in miracles.’ We are living miracles and when I see the strength of our students' Jewish identity, my belief in them and our future is only strengthened. Time and time again, possibility triumphs over probability and this must continue. The next generation is the minority who will not disappear within the majority, the few who will not fall against the many and the lights that will continue to banish the darkness that surrounds us. Chanukah is a time to learn from our past as we spark, ignite and shine through the next generation, illuminating the path ahead for a brighter future! I am sure you agree that the day a child progresses from training wheels to a ‘big kid’ bike is a proud milestone. I remember it as a child, yet, what I don’t know, is how my folks explained it to me exactly – or how I will explain it to my children. I fell a few times and just kept at it, with their guidance, till I got the hang of it. The notion of memory can be explained through three psychological processes – semantic, episodic and procedural. Combined, these store our experiences and aid us in drawing on prior knowledge to both navigate our way and provide a sense of familiarity when repeating an action. Whilst it is a simple task to recall a specific event or fact, the element that distinguishes the system of procedural memory from the other two cognitive structures, is that when trying to recall how to perform something, an explanation is always lacking the essence of experience. For example, in trying to describe riding a bike, one would unquestionably leave out subconscious processes and small details that can only be experienced for oneself. Behaviour theorists such as Ivan Pavlov, John Watson and B.F. Skinner, among others, explain that learning is not always a conscious process, but is acquired through behaviour. An interesting parallel can be drawn to the famous proclamation of our ancestors at Mt Sinai of ‘Naa’se v’nishma’ – loosely translated as ‘we will do [and then] understand’ (Exodus 24:6). The theory of both call for us to teach our children through experience, to acknowledge that one simply cannot appreciate or grasp the nature of an experience without authentic action and so the importance of experiential education as a tool to monitor and develop our own actions becomes clear. It serves as an integral way of maximising growth and allowing us to learn from our own experiences. This week we had four exciting overseas experiential programs that allow our students to do just that; our flagship Israel Study Tour starting in Poland, our new pre-IST program called Na’aleh in Israel, our celebrated Band Tour beginning in Los Angeles and our novel opportunity for graduates to intern and learn about Judaism and leadership in New York City through the Brownstone. All of these programs incorporate the idea of 'Naa’se V’nishma’, as through engaging in these enriching and unforgettable experiences, the students are provided a unique opportunity to learn about themselves and their values through practice, rather than just theory. It is with great excitement and humility that I will be heading Mosaic United, a historic initiative that allows the State of Israel and Diaspora Jewry together to galvanize participation in Jewish life and strengthen ties to Israel by fueling, scaling and connecting the most impactful innovators, programs and philanthropists. I will be sad to transition out of my role at Moriah College in 2018, but will take time to do so properly as I bring some of the best of what I have learned down under and continue to learn from other communities, together taking on the opportunity that is Diaspora Jewry in the 21st century! Necessity is the mother of innovation as the famous proverb goes and this is one of the many reasons that Israel flourishes with a tiny population and scarce natural resources in an unfriendly neighbourhood. Pioneering this year with our first Scholars in Entrepreneurship, who successfully pitched their ideas to win this world-class 10-day program to Israel, which according to the Australian Israel Chamber of Commerce, is the first of its kind, has revealed a very interesting insight into the unique ecosystem of this young State. There are a wide variety of successful Start Ups, however, by and large, the world of e-commerce such as Amazon and Alibaba, are not notable highlights of the Start Up Nation’s portfolio. When it comes to fulfilling the visions of prophets like Isaiah, for example, opening the eyes of the blind and allowing the lame to walk once more, Israeli companies like Orcam and Rewalk are leading the way. Whether it is making the world a safer place through cybersecurity, curing diseases through MedTech break throughs, creating drinking water in places it never existed and tapping into our untapped resources through RenewableEnergyTech, Israel is serving as a light unto the nations. Sitting here with our students from Moriah, with thousands of other Australian citizens to honour the Centenary of the Battle of Beersheva, I marvel at Israel’s inability to excel in areas that do not contribute in some way to healing the fractured world around us. One of the key ingredients of the secret sauce of Israel innovation is that failure is not fatal and success is never final – I think that not being able to champion gambling, e-tailing and the like is a failure we should be happy to accept. Whilst Israel focused on it’s own problems out of necessity, these ailments plague humanity as a whole, and as we share such innovation, we attempt to make this world a better place! The story is told of a father and son in Jerusalem that would do everything together. God is always around, but we do not always seek Him out and therefore while He is always close to us, we are not always close to Him. There are some time-capsules that we enter and leave the so called outside world behind – certain days in the year, moments in time, when everything else around us may be the same, but as people we become different. Kol Nidrei is on Friday night, the awesome eve of this Shabbat Shabbaton, Yom Hakippurim – this is one of those days and we are in one of those moments. I pray that you tap into the power of this moment and that the year ahead is filled with success, health, happiness and meaning. 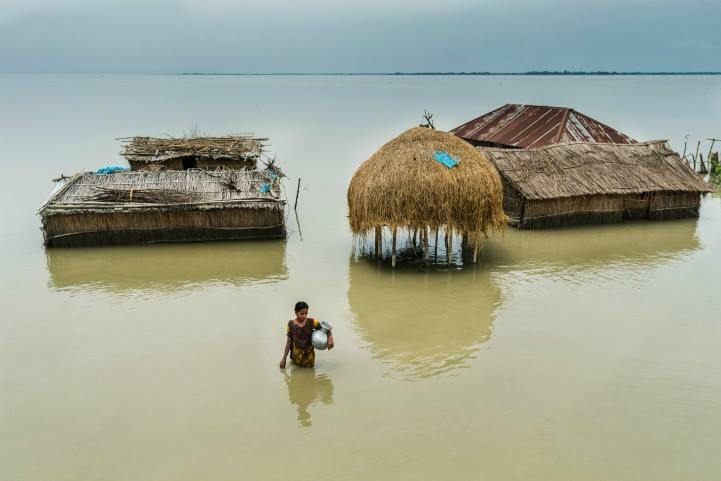 I was reading about the flooding in Texas, which is making headlines across the western world and then found an article about flooding that is happening right now in Bangladesh, India, and Nepal. Nearly three times as many people are being affected in these other places (22.6 million vs 6.8 million in Texas), yet only Texas is dominating the regular news. What is happening in Texas is a tragedy and so are the floods in these other places. It is interesting to see how the media curates our view of the world deciding which tragedies are newsworthy and which aren't. Whilst the media sometimes dictates what we see beyond our immediate environment, we should not let it limit a broader perspective. We just celebrated the wedding of my cousin Laurence Schwartz to Lara Nurick and we discussed under the Chuppah what is more important – love or commitment? In many movies, love is the pinnacle of the relationship – the focus is romance and passion. But true love is what blossoms through time and commitment. Commitment creates the framework for any relationship and love brings that framework to life, colouring it with meaning. If it wasn’t for love, it would be hard to decide to commit, but if it wasn’t for commitment, the love would never endure. Tu B’av is what many have dubbed the Jewish valentines day. But if you look at its true essence, it occurs a few days after Tisha B’av, the saddest day in Jewish history. If the deep commitment between God and the Jewish people was not destroyed through the terrible events of Tisha B’av, then our love can only flourish moving forward. This love is the paradigm for marriage and perhaps this is one reason people celebrate weddings on Tu B’av. May we always stay committed to those we truly love – Tu B’av Sameach! Before we end any Jewish wedding, we smash a glass in its entirety, in order to remember the destruction that we fast for today. But soon after, we drink l'chayim, to life. Today we didn’t drink from any glass, commemorating the attempted destruction of our people, but tonight, we drink from the half full glass as we toast and pray for a brighter future for all of humanity. The last two weeks have been the most frightening of my life. Rather than moving from a cushioned baby swing, to her quaint basinet, she goes from a sterile hospital bed to mechanical scans. Rather than waking to her loving brother and sister caressing her face with kisses, she is woken by the cold sting of an injection and other crying babies. Renana and I have debated whether or not to share something so personal this week. Given the outpouring of support for our daughter who has spent the last week in intensive care, we decided to share a thought with our community. At the outset, we want to thank so many of you from the bottom of our hearts, for the genuine prayer, care and support! She will be fine – I have no doubt she will be fine. She will come out stronger. We will come out stronger. But what can we learn, what can we do – moving beyond the paralysis of why and acting – now what? I have often thought about the utter vulnerability of a baby who essentially has zero power over her own destiny. She is born against her will, in a place she did not choose and at a time she could not control. She needs to be fed, changed, clothed and cared for because without this, she has no chance. But this is what makes the relationship so magically meaningful. Often, relationships are reduced to become a source of personal gratification. Someone to make me laugh, listen to me, give to me, provide for me... often we are so fixated on the question ‘what can I get,’ we fail to ask, ‘what can I give.’ The Hebrew word for love, ahava comes from the word hav – give. We only love what we give to. We can only truly love what we can truly invest ourselves in. A cause. A character. A calling. We need all of these things and in our children we find them. Our children are the nexus that unites the power of our past with the legacy of our future. Through them, we understand what it truly means to touch eternity, to give without receiving, to start something with no end, for they will come to touch, give and start so much themselves. So what can I learn from Lital in her moment of pain? The child that didn’t cry out or need anything extra, suddenly needs all the extra energy we can muster up. She is still as calm as can be – but she calls on us not to be calm about our love for her. So what am I forced to do? Leehov – To love. She needs more, so I need to give more and therefore love more. That’s all we can do. Bechol levavcha, ubechol nafshecha uvechol meodecha. To love with all our heart, with all our soul and with all our might. And when we will have come through this ordeal, we will understand our capacity to love even more. So what can you learn from Lital Gila bat Renana Yael? We begin life young and helpless so that others can be helpful. We often end life old and powerless to empower others. Don’t wait to help – don’t wait to be helped. Don’t wait for an excuse to connect to your loved ones – make an excuse to love. And then love some more. "Now the commencement speakers will typically also wish you good luck and extend good wishes to you. I will not do that, and I’ll tell you why. From time to time in the years to come, I hope you will be treated unfairly, so that you will come to know the value of justice. I hope that you will suffer betrayal because that will teach you the importance of loyalty. Sorry to say, but I hope you will be lonely from time to time so that you don’t take friends for granted. I wish you bad luck, again, from time to time so that you will be conscious of the role of chance in life and understand that your success is not completely deserved and that the failure of others is not completely deserved either. And when you lose, as you will from time to time, I hope every now and then, your opponent will gloat over your failure. It is a way for you to understand the importance of sportsmanship. I hope you’ll be ignored so you know the importance of listening to others, and I hope you will have just enough pain to learn compassion. Whether I wish these things or not, they’re going to happen. And whether you benefit from them or not will depend upon your ability to see the message in your misfortunes." Advertisers don’t always want our full attention – sometimes they just want half of it! If you were to really concentrate on the message, you may judge it critically. The central route of persuasion appeals to the rational mind, so sometimes the peripheral route of persuasion is used to influence our subconscious. Have you ever wondered why the adverts on TV were louder and brighter than the programs? With your brain distracted, the message can bury itself in your subconscious without your rational mind being able to judge the quality of the information. Our environment impacts who we are so consciously choose what your subconscious lets in! The average entrepreneur starts and fails with 3.8 businesses before getting a successful one off the ground. You might think this repeated failure is a sign of weakness but it's not. Failure can sometimes lead to greater success as John C. Maxwell shows in his Failing Forward through countless examples such as Sergio Zyman. When Zyman, a top marketing executive for Coca-Cola in the early 80s, launched the new Diet Coke range, it was hugely popular. In 1985, the company wanted to introduce a new formula of Coke to the market, and Zyman decided they introduce it as New Coke, taking the old classic formula off the market. The rebranded bottles failed to sell, costing Coca-Cola approximately $100 million, and Zyman his job. To recover from this blow, they reintroduced their flagship drink under a new name: Coca-Cola Classic. The failure of the New Coke campaign actually led to better sales and higher market share of the classic, bolstering Coca Cola to lead once again. Even Zyman came out okay in the end as Coke rehired him in 1993, realizing that bold thinkers cannot be right every time. The word for crisis in Hebrew is mashber, coming from the word shever meaning broken or fractured. But this same word is also used to refer to a turning point and a child-birth chair. This seeming contradiction clicked for me a few weeks ago when my wife gave birth, for it was the pain of labor that lead to the joy of birth. Sometimes, amidst the difficulty of ending one thing, another is being born and this notion should sometimes propel us to push forward that extra step. 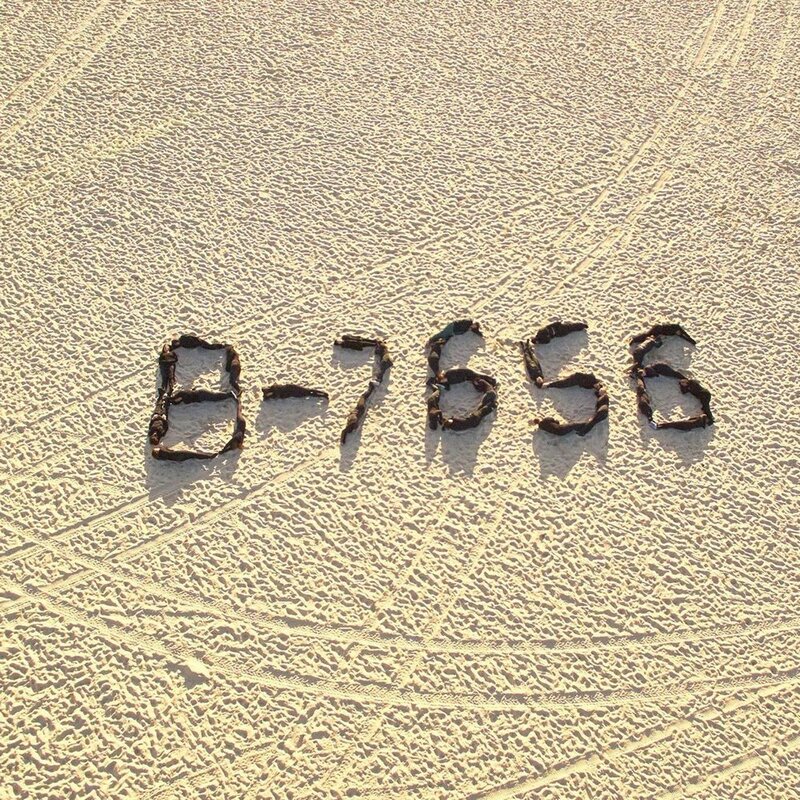 When attempting to fly around the equator, American Pilot Amelia Earhart crashed her plane on takeoff. If she would have let this set her back, she would not go on to achieve six world records, including that of the first solo female pilot to fly across the Atlantic for which she received the Distinguished Flying Cross and wrote best selling books. Israel is a leader in security and terror medicine because they were forced to deal with these terrible difficulties first hand. This sense of bouncing back and utlising a potential crisis as a turning point can lead to despair and desperation or improvement, ideation and innovation - it depends which way you turn!